Disco dance skating? 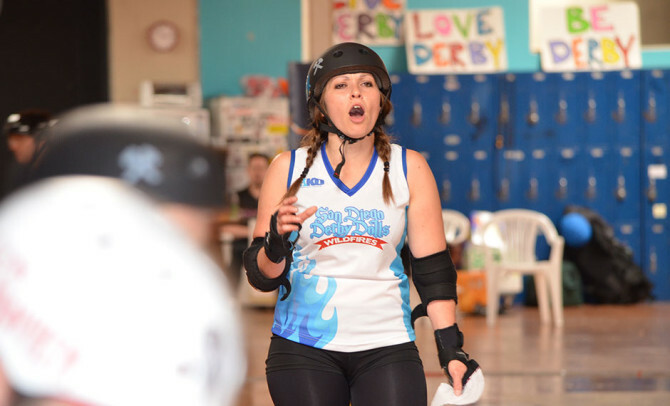 You must be confused, I play roller derby! Knowing how to dance your way out of a fall, transition in both directions at any moment and being able to skate backwards, will give any skater the advantage over others in a pack. Mastering basic yet simple amazing skating skills will only improve your derby skills that you already know. The goal is to almost forget you have skates on and be able to make any sudden movements effortlessly. Proper transitions (lift, look, step, step) never glide into a turn. Skating backwards and not just with both feet on the ground. Pack transitions – touch two skaters in a pack, 180 and/or 360 in the pack ending up touching the two people you started with. Cone stops (Singles and groups) – set up cones, alternating from inside line to outside line. Skater must 180 towards the inside of track. Alternate from cone to cone.